This low, rounded shrub with gray-green, spoon-shaped leaves has a double treat from its blue flowers that emerge from whorls of magenta flower bracts. 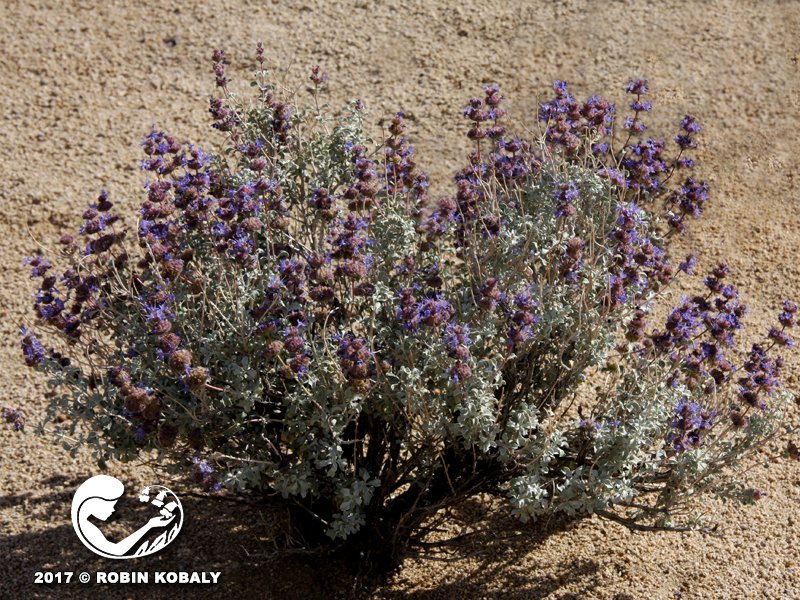 Mojave Desert Sage is an aromatic, native “shrublet” with striking blue-violet flowers that emerge from purplish, ball-shaped flower heads along the stems. This compact, herbaceous perennial is impervious to rabbits and deer, while enticing all types of bees, pollinators, butterflies, and hummingbirds. A compact, moderately fast-growing sub-shrub, this gem of a plant has a wonderful minty aroma, released when the silver-gray, spoon-shaped leaves are rubbed. This evergreen plant usually spreads wider than high. 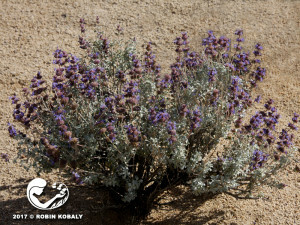 Mojave Desert Sage is a heavy bloomer that loves the hottest, most challenging sites in your yard. Trim off seed heads and lightly prune to shape after flowering. 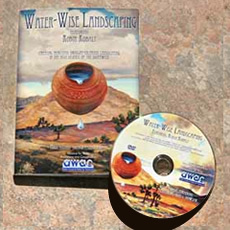 While more water results in more flowers, be careful not to water in summer. This mint-family treasure can be used for borders, accents, bank stabilization, and in gardens designed for butterflies, hummingbirds, bees, and birds.